Ocean Oasis is a recently remodeled and tastefully decorated 1/1 condominium situated directly on the Atlantic Ocean on beautiful South Hutchinson Island. The unit sleeps 5 and is pet friendly (up to two well-behaved dogs) with leashed dogs allowed on the beach. Ocean Oasis is located in the Spoonbill building in beautiful and serene Indian River Plantation, also home to the Marriott Hutchinson Island Resort. Enjoy our private balcony directly overlooking the Atlantic Ocean. The building has a great pool with restrooms, lounge chairs and tables and a private beach entrance for Spoonbill and Pelican owners and their guests only. Directly adjacent to the building is the Marriott Sandpiper which has a Tiki Bar serving food and drinks. We provide four beach chairs for your use during your stay, but if you don't want to carry them chair and umbrella rental is also available at the Marriott for $25 all day. Bring your boat! Rent a slip at the Marriott’s 77 slip marina. You can rent a boat or jet ski at that same marina. Paddleboards, surf boards, and snorkel gear are also available for rental just across the street from IRP. The property is located on South Hutchinson Island in Stuart FL. 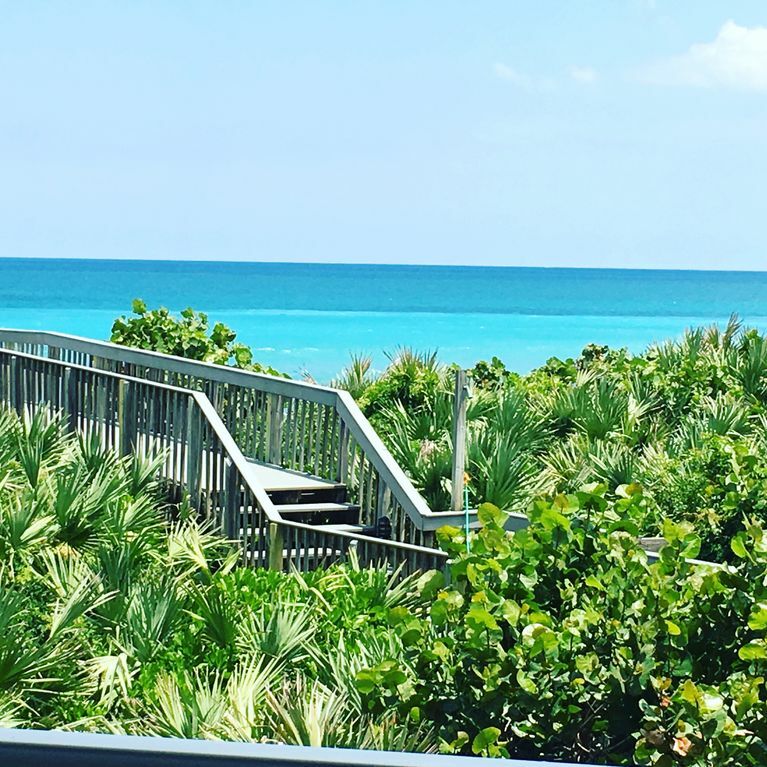 Steps away from the condo are miles of uncrowded coastline to explore. The area is ideal for romantic getaways as well as for families with children. There truly is something for everyone. This area of Florida is called the Treasure Coast due to the numerous shipwrecks along the coral shoreline where coins and gold have washed ashore or been found by divers. Take a stroll down the beach in either direction to explore. To the north is Stuart public beach where you can grab a burger or hotdog at the Chef Shack. To the south is Chastain Beach with beautiful coral outcroppings and a popular place for local surfers. Further south you’ll find the House of Refuge Museum and Bathtub Reef Beach which is great for snorkeling. Explore the rich local history as well as abundant wildlife at several museums located within 1.5 miles of the property. Visit historic downtown Stuart for world class shopping and dining. Be sure to check out the Rockin’ Riverwalk free concert every Sunday in front of the Boathouse Restaurant and bar. We (Vanessa and Mike) both grew up in NY, met and got married here in sunny Florida, and currently reside in nearby Palm City, FL with our daughter Naomi. We know you'll enjoy our second home as much as we do! The building is great, the beach is beautiful, and nearby downtown Stuart is a great place to get some delicious food and unwind. There are tons of activities all around you at Ocean Oasis! As dog owners ourselves we love to bring our furry friend Dakota on vacation down to the beach with us. Pets deserve a getaway too! One of the great things about Ocean Oasis is your pet is welcomed in the building as well as the beach as long as he or she is leashed. Really enjoyed it. The place was renovated very nicely. I hope to stay there again soon! Thanks again! This rental was great! It looked even better in person and was spotless when we arrived. The location was perfect and heated pool was awesome. The owners were super responsive and clearly organized. We would not hesitate to book this place again. Start with an awesome location overlooking the pool and the beach. Then the condo is beautifully decorated and appointed with lots of attention to little details and amenities. At the price I was not expecting this nice a place. Mornings watching the sun rise and the spoonbills skim the waves is therapy beyond imagining. Wonderful condo, fabulous location, thoughtful hosts. We really enjoyed our stay! The condo was very clean. The kitchen had everything we needed plus some. The beach is even closer than I thought it would be. It was amazing!! We used the beach chairs everyday, that was a real plus having those to use. Vanessa made everything so incredibly easy for us. My kids enjoyed the pool at the property next door while we enjoyed some cocktails. Close to Spring Training Baseball as well, we enjoyed 2 games during our stay. We would stay here again. It's a very lovely area. Thank you for sharing your condo. "Ocean Oasis" was the perfect setting for our family vacation. It was very clean with a very welcoming beachy feel! The condo was well furnished and equipped with everything we needed to enjoy a great week! The 5 of us relaxed and slept very comfortably! The 4 beach chairs and good supply of towels were greatly appreciated and put to good use on the beach which is right out your doorstep! We also enjoyed the outstanding view and sound of the ocean from the patio, the friendly folks at the pool and the convenience and fun of having the Marriott TIKI Bar a very short walk away. The condo was in a great location for us to re visit many of our favorite shops, restaurants and beaches we have enjoyed over the years on Hutchinson Island. Will definitely return!